We collaborate with the most important operators of congresses and tourist services. We are a leading company in tourist transport, congresses and incentives in the Costa Dorada. We offer services with a large modern and innovative fleet. To make your event a success, we have marketing services on the move with luxury vehicles and all the capabilities. Coverage of 100% in the province of Tarragona. Technical assistance by qualified and decision-making staff. Control and coordination of resources. We have a modern fleet with the latest advances in equipment, comfort and safety. We offer a large fleet of vehicles from minibuses and minibuses to high capacity coaches. In addition to own workshop, possibility to adapt the interior of the vehicle to your needs and personalization with customer identification plate. In 2011 we were awarded with the recognition of the best national company of discretionary transport by the National Association of Transport Businessmen, in 2016 we received the APPORTT Award in the category of Professionalism and special dedication to the promotion of the Port of Tarragona, in 2017 we were awarded the CEPTA Prize, for the best family company of the Província de Tarragona. Prizes that fills us with pride and encourages us to continue working at the highest level of quality, satisfying the expectations of our customers and users. Autocares Nika SL is a third generation family business dedicated to discretionary passenger transport, founded in 1972 in Tarragona. 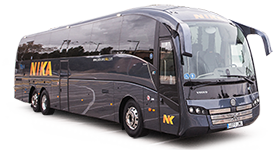 Only in 2014, Autocares Nika SL provides a discretionary transport service to 700,000 passengers to or from the Costa Dorada. We arrive where there is no public transport. And we render the services demanded by the Market. Presentation of the Magelys Autocars. Autocares NIKA incorporates two new high-end panoramic coaches into its fleet. Opinion of Enrique Sánchez, Director of Operations Autocars NIKA, S.L. The Association of Entrepreneurs and Entrepreneurs (ADEE) – BPW Tarragona rewards the professional career of several women in the counties of Tarragona. NIKA coaches incorporates two new high-end panoramic coaches to your fleet. We offer the best possible transportation service. We have a wide team of professionals willing to advise you.